Life, et al. : Book Review: "Salsa Invertebraxa"
When E. O. Wilson wrote Consilience: the Unity of Knowledge (1998), he meant the word "consilience" to mean not purely convergence of multiple disciplines towards one thesis (as the word is defined), but an overall commonality between science and the humanities. As someone in whom both sensibility and sense both run strong, such rare intersections of artistic and scientific endeavor are of great interest to me. The book Salsa Invertebraxa (2011), by British-born conceptual artist Paul Phippen (under the nom de plume "Mozchops"), under this definition, is a spectacular instance of consilience. I give him full credit for all the artwork seen herein. Need I say that sizing this work like so does it a great injustice? So buy the book, darn it. BUY THE BOOK. The book would be classified as a graphic novel (the selecting committee for the Aurealis Awards evidently believed it to be such), in that it tells a narrative just as much through imagery as through verbiage: neither can stand alone. Some paintings lack text, and are fine pieces in and of themselves (the artwork is in general exquisite); my personal favorite (War; see above) rivals Eugène Delacroix's La Mort de Sardanapale (1827) as a canvas-daubed oratorio of orgiastic violence; but a novel recounts a story, and Salsa Invertebraxa indeed has one. As to what the narrative tells—this is difficult to surmise, let alone explain, for reasons that will be amply revealed in due course. In terms of perspective, it focuses completely upon arthropods: a hummingbird can be seen sipping nectar in the background of one painting; and we glimpse the ear of some large mammal (perhaps a rhinoceros) in another. That is all. Anything resembling a gastropod, annelid, or even a terrestrial crustacean is absent. 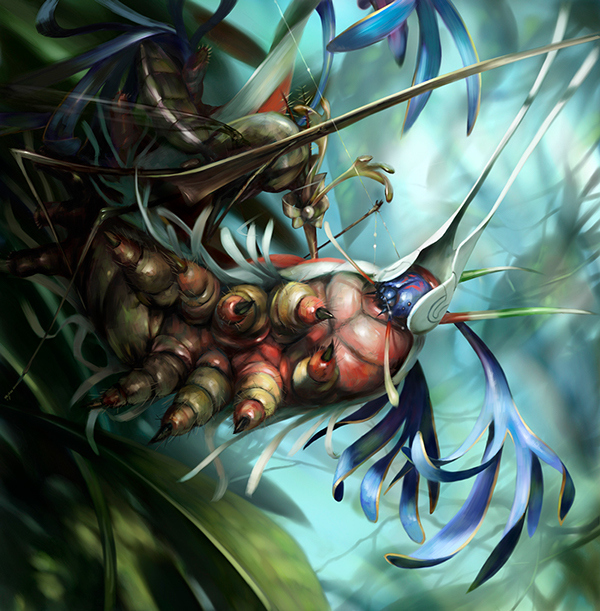 In the department of the tale being told, Salsa Invertebraxa appears to portray the exploits of two insect companions in the microcosmic world of some rainforest that cannot be placed. One is something resembling a mosquito, the other, I don't know (possibly inspired by a webspinner). For convenience, I'll call them Bugs #1 and #2. Their quest? Egg thievery. Their first act in the book (no chapters or other divisions exist—page numbers are also lacking) is to steal a caterpillar's corpse from a jumping spider; Bug #1 uses this as a lure—rigged as a marionette with spiderweb strings—to trigger a trapdoor spider's trip lines, while Bug #2 pilfers a handful of her eggs, to be stashed along with others in the pores of a tree's bark. Two-thirds of the way through the "novella", they protectively don treehoppers' cephalic exuviae and joust on the backs of caterpillars trailing exoskeletal pennants. Yet there is an accident—at least an event that we can assume to be unintentional: the two collide, and Bug #1 is cast from the foliage into the depths of a pitcher plant, with #2 injuriously falling all the way to the forest floor. Marching to the beat of an unseen boss. The fodder to the cannons. It must be emphasized that this verse is incomplete without the image it accompanies: a mass of termites crawling to battle. Thus you can surmise Mozchops' writing style: he describes events poetically—by implication, through the narration of our protagonists; refusing to recount the narrative (which makes no sense regardless) in a straightforward manner. Naturally, this forces the reader to reread for comprehension (whatever can be gleaned); this can be either infuriating or entrancing, depending on your particular taste. Since the graphic novel is a medium not yet fully aware of its potential, Salsa Invertebraxa is refreshingly nowhere at all self-conscious of its deep nuance. However outlandish the fauna may be, the author draws upon reality: viz. the forceps-headed green flying insect seen in the above picture, which bears the legs of a leaf insect (Phylliidae). Subtler cues indicate that this is not our own existence, and rather an oneiric fantasy: the fabulous caterpillars have one too many leg pairs; the army ants would appear to belong to Eciton, but bear thoracic spines and have the color scheme of Oceanian Oecophylla longinoda (weaver ants); and we see what would be a dead ringer for a luna moth (Actias luna) were it not for its two streamers (as opposed to one) per hind wing. Female damselflies become airborne not with the aid of wings, but with bubbles emitted from the juncture of their pronotum and mesonotum, in an instance of the more fantastical (albeit aerodynamically plausible) extravagances that abound. Given all of these artistic liberties, how can I in all honesty dub Salsa Invertebraxa an equitable yoking of art and science? In a sense, this cannot truly be claimed: Mozchops makes no pretense of drawing upon science for purposes of fiction (and as such nobody can call him out for inaccuracies, even were they not to my mind most probably deliberate). In another sense, however, this book can be rightly termed consilient. 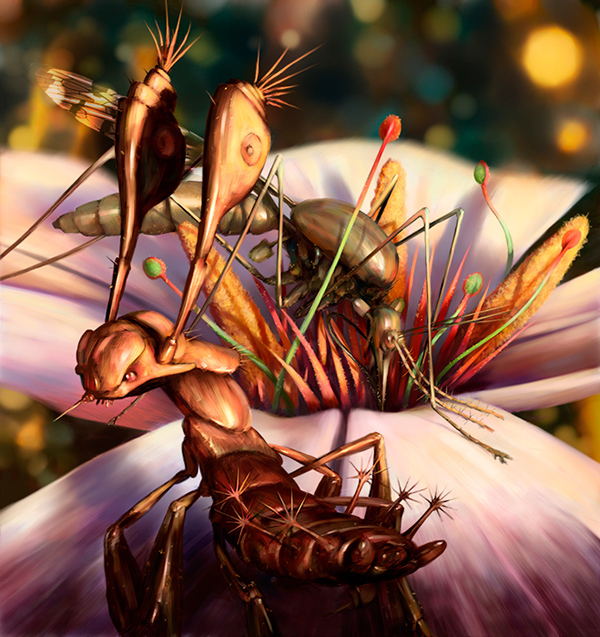 For in the riotous imagination that Mozchops sets free, in the detail and respect with which he treats his splendid chitinous creations, the essence and spirit of entomology can be perceived—the appreciation of, and admiration for, the wondrous frenzy of arthropods that inhabits our planet. Mozchops (2011). Salsa Invertebraxa. Hong Kong: Pecksniff Press. Wilson, E. O. (1998). Consilience: the Unity of Knowledge. New York City: Alfred A. Knopf, Inc.